With his participation in the American Academy of Cosmetic Dentistry Charitable Foundation’s Give Back a Smile program, Dr. Michael Fulbright donates his services to help individuals affected by domestic and sexual violence restore their teeth and renew their smiles. 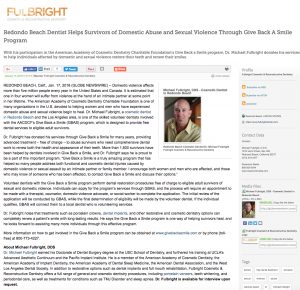 Redondo Beach, CA – Domestic violence affects more than five million people every year in the United States and Canada. It is estimated that one in four women will suffer from violence at the hand of an intimate partner at some point in her lifetime. The American Academy of Cosmetic Dentistry Charitable Foundation is one of many organizations in the U.S. devoted to helping women and men who have experienced domestic abuse and sexual violence begin to heal. Dr. Michael Fulbright, a cosmetic dentist in Redondo Beach and the Los Angeles area, is one of the skilled volunteer dentists involved with the AACDCF’s Give Back a Smile (GBAS) program, which is designed to provide free dental services to eligible adult survivors. Volunteer dentists with the Give Back a Smile program perform dental restoration procedures free of charge to eligible adult survivors of sexual and domestic violence. Individuals can apply for the program’s services through GBAS, and the process will require an appointment to be made with a therapist, counselor, domestic violence advocate, or social worker to complete the application. The initial review of the application will be conducted by GBAS, while the final determination of eligibility will be made by the volunteer dentist. If the individual qualifies, GBAS will connect them to a local dentist who is volunteering services. Dr. Fulbright notes that treatments such as porcelain crowns, dental implants, and other restorative and cosmetic dentistry options can completely renew a patient’s smile with long-lasting results. He says the Give Back a Smile program is one way of helping survivors heal, and he looks forward to assisting many more individuals through this effective program. More information on how to get involved in the Give Back a Smile program can be obtained at www.givebackasmile.com or by phone (toll-free) at 800-773-4227. Dr. Michael Fulbright earned his Doctorate of Dental Surgery degree at the USC School of Dentistry, and furthered his training at UCLA’s Advanced Aesthetic Continuum and the Pacific Implant Institute. He is a member of the American Academy of Cosmetic Dentistry, the American Academy of Implant Dentistry the American Academy of Dental Sleep Medicine, the American Dental Association, and the West Los Angeles Dental Society. In addition to restorative options such as dental implants and full mouth rehabilitation, Fulbright Cosmetic & Reconstructive Dentistry offers a full range of general and cosmetic dentistry procedures, including porcelain veneers, teeth whitening, and periodontal care, as well as treatments for conditions such as TMJ Disorder and sleep apnea. Dr. Fulbright is available for interview upon request.